Aleksandra Holod is a senior researcher at AIR. Dr. Holod has a decade of early childhood policy experience. Her areas of content knowledge include child care and pre-Kindergarten program quality, and low-income and at-risk families. Her recent studies include evaluations of California’s quality rating and improvement system, transitional Kindergarten programs, and recent welfare reform legislation. She has also conducted research on the childcare choices of welfare recipients in New York City. Dr. Holod's methodological expertise centers on research design and advanced quantitative methods. 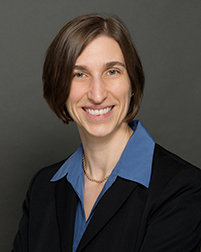 She is well versed in quasi-experimental and correlational study design, analysis of complex survey data, multi-level modeling, structural equation modeling, and basic econometric techniques. She is also a What Works Clearinghouse certified reviewer through the U.S. Department of Education's Institute of Education Sciences. Dr. Holod was previously a research fellow at Columbia University’s National Center for Children and Families, a policy analyst for a ballot initiative campaign to establish a public pre-K program in California, and the manager of a municipal fund for children’s services. She also worked as a preschool teacher early in her career.